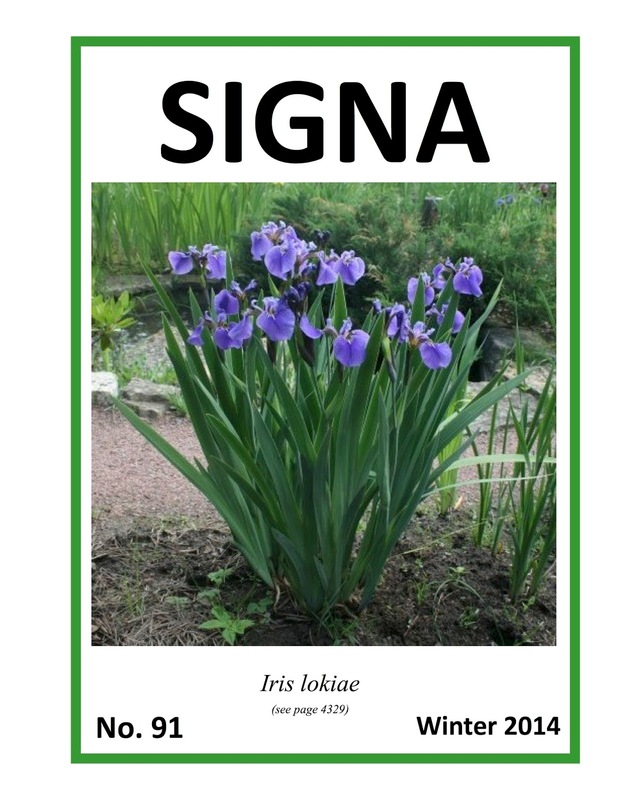 The new Winter 2014 edition of SIGNA (the Species Iris Group of North America) is out, and here's an introduction and short recap. As we say in SIGNA, invite a friend to check what SIGNA is all about and/or to join the society. They won't regret it and neither would you. To join please visit our webpage, here. 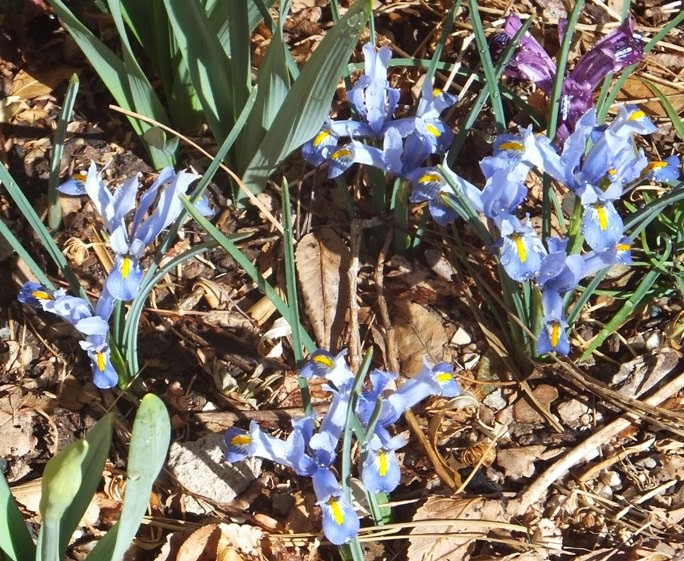 In this issue, a fantastic article and introduction of two irises you may not have heard about: iris boissieri and iris serotina. 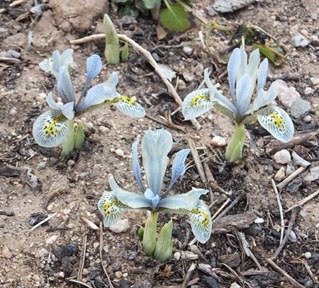 Both are part of the iris Subgenus Xiphium that occur in the wild from the northwest of Morocco in North Africa, to as far east as the heel of Italy and also West into Spain and Portugal. 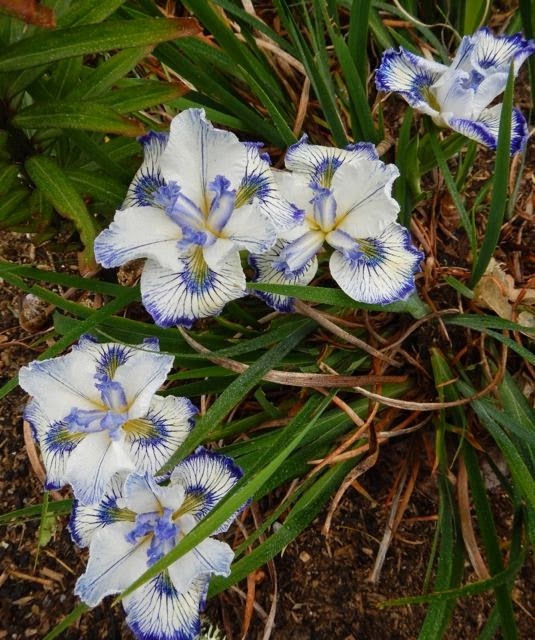 From Russia, Nina Alexeeva introduces us to a new iris from the Kuril Islands, Iris lokiae. Find this exciting article in the section Irises from Russia. 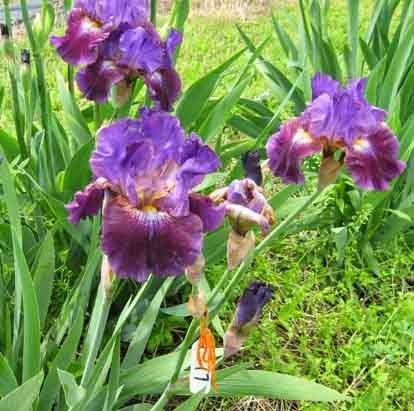 You will also find wonderful list (including pictures) of recent introductions of SPEC and SPEC-X irises. A couple of white irises that caught my attention, and yes you may call me a white iris fool. 'Sushi' ( by Jill Copeland, R. 2013) an I. pseudacorus X Ensata cross; and 'Precious Pearl' a crestata iris (by Barbara & David Schmieder, R. 2012); added them to my must-get list for next year. N. B. Аlexeeva, Curator. What an fantastic, detailed, historical account of this important organization. Loved this article and it made me aware of the amazing dedication and work that people do for the love of iris around the world. There are so many more wonderful topics covered on this issue of the SIGNA Newsletter, we hope that you will consider becoming a member so you can read it in its entirety. 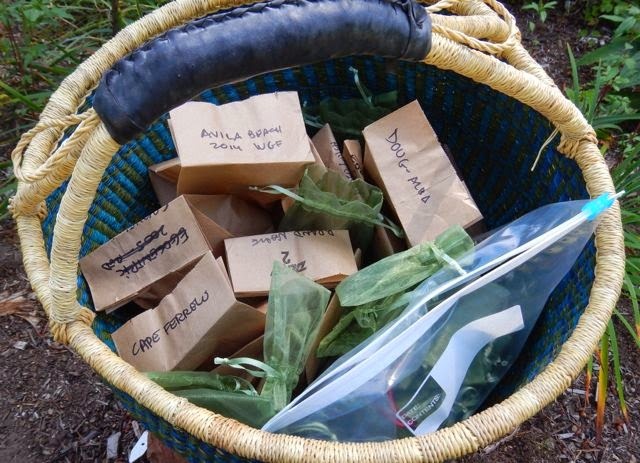 And, now for some more exciting news: The SIGNA Seed Exchange is now available. What is the Seed Exchange? For me, it's a wonderful way to grow species and other iris types in seed form to grow in my garden that otherwise I may not be able to obtain. The SIGNA Seed Exchange is a major benefit to SIGNA members. It is also the main fund raiser for SIGNA. The proceeds go toward the publication of the SIGNA Bulletin and help to sponsor collecting trips, special publications, and research grants. Although it is only available to SIGNA members, you may become a member when you order seeds. More information, here. 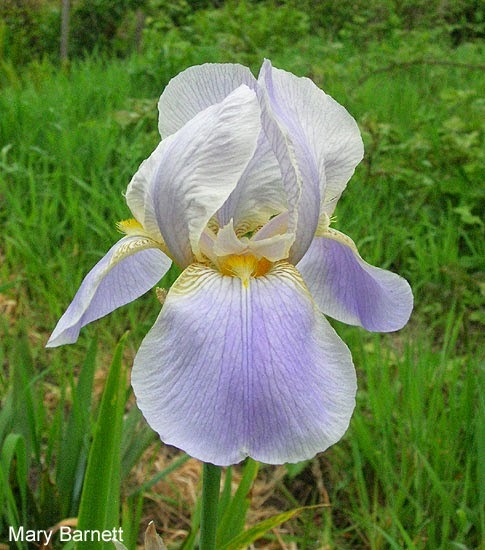 Do you grow species irises, and what types do well in your area? 'Earl of Essex' has been used by many people and it has produced many rebloomers, but I'm not sure it has received all the praise it deserves. It is one of my favorite parents due to the fall form, which is round, and its willingness to pass on its rebloom genes. On the negative side it is a cycle rebloomer, it is short, and it is a plicata. Those are drawbacks because I work with summer rebloomers, prefer tall seedlings, and dislike the messy hafts that come along when crossing plicatas and selfs. I've been told that the messy hafts come along with the plicata breeding since they have not been removed from the plicata gene set, and although these genes are not specifically a part of the plicata gene, they ride along with it. Common sense tells me that the shorter plant should be used as the pollen parent with the taller plant being the pod parent, but this is not possible when you don't grow both plants. Sometimes we get pollen from other growers, you see. A friend donated pollen from 'Hot Streak' (Ghio 1999) and I crossed it to 'Earl of Essex', and 'Radiant Bliss' was the result. I'm extremely glad I didn't follow common sense! Once I moved to Mitchell Weaver Road, and established a short row of 'Radiant Bliss', I looked for a rebloom partner. 'Summer Radiance' stood tall and proud just a few plants over. Both plants are tall, so it wouldn't matter which was taller, but 'Summer Radiance' rarely sets pods so I used it as pollen parent. There were several seedlings from the cross that rebloomed, and although some were red, the best one I named 'Summer Honey.' In 2011 it managed to bloom from spring through fall freeze. It was a nice, relatively moderate summer, and I did water every ten days or so when there was no rain. I received a letter with pictures of it reblooming in Oregon in 2014. It was gorgeous. Below is a picture of the stalks that were cut down in the fall freeze of 2011. Five stalks growing from one rhizome. 'Radiant Bliss' was crossed onto 'Innocent Star,' resulting in five rebloomers. 'All Revved Up' is one of these rebloomers. It passes rebloom on to many of it children. 'Rebound' (Wilkerson 96) was used on 'Innocent Star' and produced 'Echo Location' and four other rebloomers. Below is a picture, showing the netting beside the beard, that I understand indicates it is a plicata. 'All Revved Up' and 'Echo Location' share 75% of their genes. 'Echo Location' was crossed onto 'Again and Again.' There were three rebloomers, but 2130-01Re is the only seedling I kept from this cross. It's not as pretty as I thought it was in maiden bloom. It was a solid purple self in maiden bloom, but this is what it looks like now. I've crossed 'Over and Over' onto this seedling. Many have been planted and some may bloom this spring. Stay tuned for an update on the seedlings. Yes, as a result of my soil experiments there were more flowers than ever in my garden in 2013. But it's the number of Pacific Coast Iris (PCI) pods that was astounding. 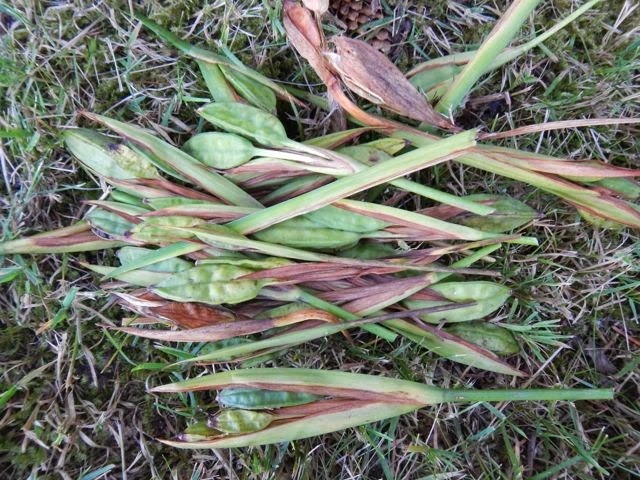 In prior years I'd seen around 50-70 seed pods in total. I know this because I use organza mesh bags on ripening pods to keep them from tossing seeds all over the garden, and I could count the bags as they went out. I'd purchased 400 bags and used 70 in 2012, on every pod I could find. And this had seemed typical at the time, based on prior years' seed sets. Tools of the seed collecting trade: mesh bags, paper bags, and somewhere in the bottom of the basket, a writing implement and clippers. By 2013 I used every mesh bag, some of them several times, shifting from early ripening pods to later ripening pods. A friend found a few more bags at a yard sale and gave them to me; I used them as well. I cut pods off many plants, needing at most 15 pods of each variety for the SPCNI seed exchange, and threw away at least 100 pods. So in one twelve-month period, my irises went from producing around 70 pods, to producing around 500 pods. The only thing that changed was the soil's mineral nutrition. Some of the extra pods. Look closely at the top of the image to see seeds spilling out in the lawn. Just a few of the many pods I tossed in 2014, from the plants that set seeds. There was also a major weather difference that reduced the seed set for many PCI. Many of my well established plants are hybrids that flower in May and early June. A typical year has PCI in flower from April until late June or early July. We had a late wet spring in 2013. I did not get any seeds from the early flowering PCI. The later flowering species and species crosses that bloomed in mid June were more successful, as they flowered in drier weather, and bumblebees could actually get to their flowers. So this astounding pod production was despite very poor early-season weather for seed setting. One hybrid I very much wanted seed from, 'Finger Pointing', did not set any seed at all! PCI 'Finger Pointing' managed to hit the wrong weather to set seed in 2014. In 2014, I resampled the soil, had another mix of minerals formulated based on the new soil test, put these out in winter––this time we did it all in one application, and then I again waited for spring. I also added compost to most beds, and continued to plant new plants with a mix of compost and biochar. My hope is that these high-test carbon compounds will help with mineral retention in coming years. Ongoing soil tests will tell me how successful this is. Again the weather did not cooperate. In spring 2014, my area had an early, very warm hot spell that lasted several weeks, with temperatures in the low 90s to low 100s––for the South Coast of Washington, it was hot. 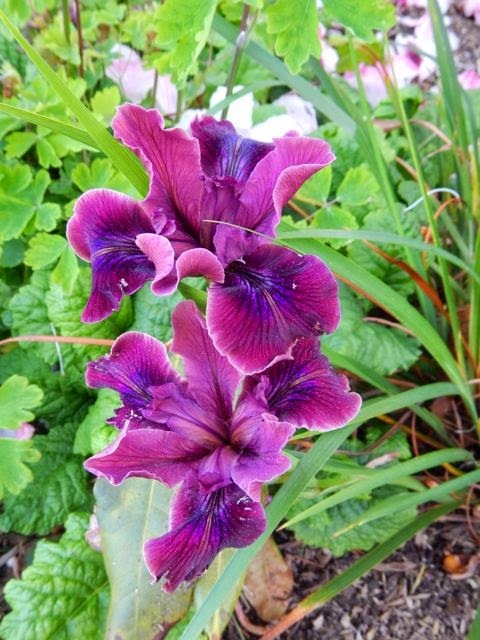 In response, irises that normally flower over three to four months all flowered in less than six weeks. The bumblebees were badly overworked! Early flowering (April to early May) PCI responded with heavy seed sets and a short intense flowering period. This unseasonal heat was followed by cool rainy weather in late May into June, so late flowering PCI did not set as much seed, the reverse of the prior year, though the tenax x innominata plants again set many extra pods. I once again used all my mesh bags, and again cut off more than 100 extra flower spikes with more than 200 pods to reduce final seed volumes on those plants that did set seed. PCI 'Mission Santa Cruz' is an old, tried and still true iris for gardens. Even this one failed to set any seed in 2014. Observant readers will note that I have not written about Nitrogen or N-P-K formulas. I did not add N or N-P-K in 2013 or 2014. A properly mineralized soil does not need much N. When healthy, the soil contains microorganisms that fix N and make it available to plants. There's another very important reason to not add N: Nitrogen fertilizers stimulate microbes to metabolize carbon compounds in the soil. My soil is acidic sand; I do not want to lose any carbon if I can find a way avoid it. Also, post World War II, the use of N fertilizers has wreaked havoc with historic soil carbon levels around the world. So I save money by not using standard N-P-K mixes, and instead spend it on custom blends. If you read about historic versus current levels of minerals in vegetables, it's staggering to learn that mineral levels in food plants have dropped by 3-10X from those of a century ago. This bears directly on food health for all of us, as well as flowering and seed setting capacity for those plants we eat, not to mention those we grow for pleasure. It seems clear that improving minerals in soils leads to improved seed sets (see Jeff Lowenfel's Teaming with Minerals). Other gardeners have commented on my use of inoculated wood chips. Most native plants in the West, especially in forest and woodland conditions, grow with soil fungi. In my garden,it is a measure of success to have mushrooms growing among ornamental plants. When I dig up iris plants, I see abundant feeder roots interacting with aged wood chips and soil fungi. In Fall 2013, chanterelle fungi were fruiting on a garden path next to several iris plants; this path is layered with several years worth of wood chips. Success! In Winter 2015 I'm about to sample my soil again, and take the results to my local soil consultant. I can't wait to see how my PCI respond this spring. No guesses on the weather, though. In the past two years, I've seen both early and late flowering plants shut out by weather from successful seed sets. What I do know is that those PCI that manage to set seed are likely to set a lot of it! In 2010 I began to learn about providing better nutrition to soils so that plants will grow in optimal conditions. Healthy plants not only overcome herbivory, disease, drought and other adverse conditions to flourish, they grow larger, flower more and set more seeds. These plants have higher levels of secondary plant compounds, sugars, and other metabolites. Optimal nutrition for healthy soils to produce healthy plants is not a matter of applying N-P-K fertilizers; instead the focus is on balancing minerals and adding carbon compounds. Systematically testing soils is the first step; the second step is adding those minerals that are low or absent from your soil. Adding additional organic matter, or carbon, in the form of compost, fungi-inoculated wood chips and biochar is another good step for some soils, particularly temperate forest soils. Plus patience, and resampling soils every year as you change the mineral composition. I was excited to see how my plants would respond, even though I grow few food plants (some herbs, a few parsley plants––all plants that deer usually avoid). 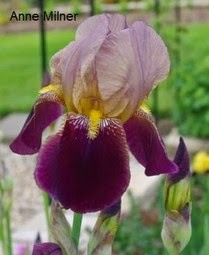 In my garden, historically I used compost and biochar every time I planted a new iris. Every two or three years, a new layer of compost was added over each garden area. I've also used wood chips, preferably red alder chips, aged for a year so that fungi have inoculated them before they go into the garden beds. I've done this for more than 20 years, and until 2010, I thought I was doing pretty well. That year I began reading about minerals, soil carbon, and soil health. 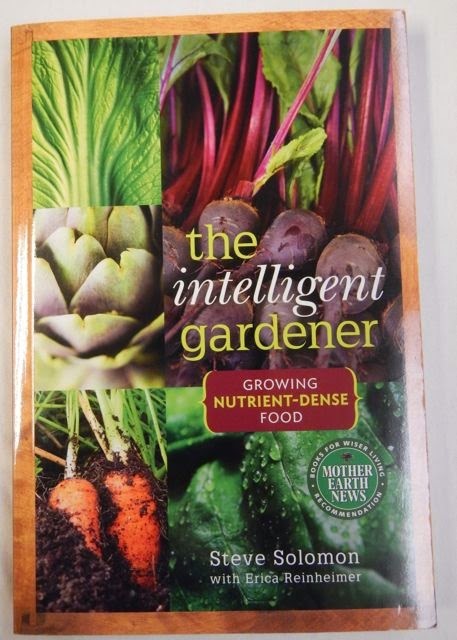 First, I read the latest book from Steve Solomon on vegetable gardening, The Intelligent Gardener. Steve lives and gardens in Tasmania; in a former life he lived in Oregon, where he started Territorial Seeds, a vegetable seed company for the Pacific Northwest. He and his family lived on what he could grow in the garden for several years. He composted, irrigated, added manures, and generally followed traditional organic farming guidelines. It took him decades to learn about how to make high quality composts, and even longer to learn about soil minerals and soil health. Now in his 70s, Steve's latest book is a tour de force for gardeners, distilling a lifetime of gardening knowledge for all of us. 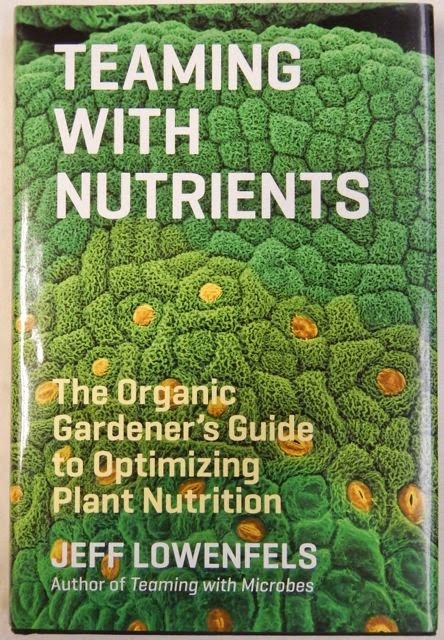 Whether you garden for pleasure, or food, or both, read this book. 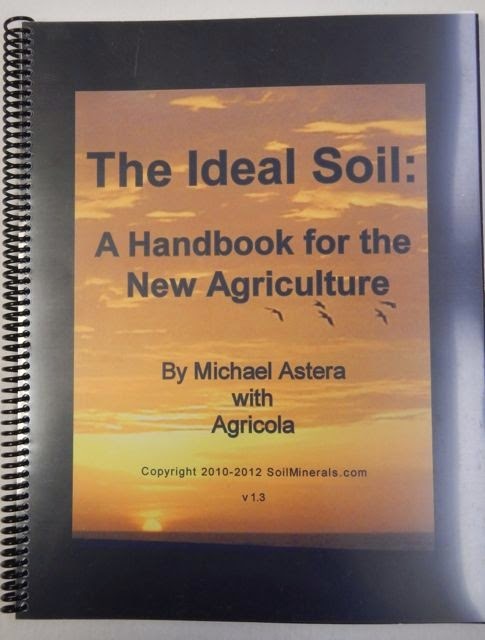 Second, I read Michael Astera's book on soil nutrition and cation-base exchanges, The Ideal Soil: A handbook for the new agriculture. IMO, a gardener with high school chemistry will understand both Solomon's and Astera's books. 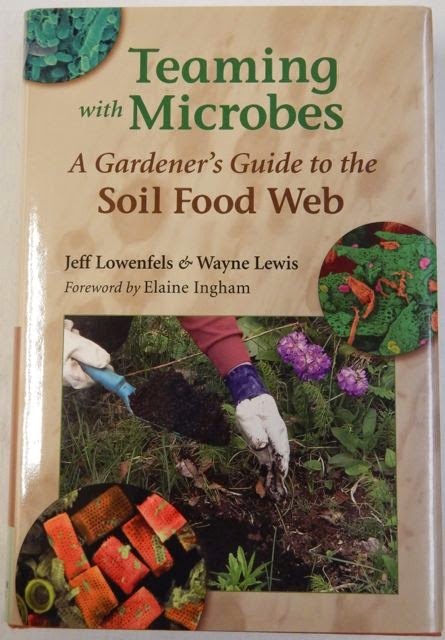 For a third read on this subject, there is Jeff Lowenfel's Teaming with Minerals, a companion to Teaming with Microbes. Read both of them too. Living in a high rainfall area, it makes sense to me that water soluble nutrients are low in my soil; the opportunities for them to mobilize are too good. Yet compost and well-inoculated wood chips are not be putting back everything that my soil needs in the way of minerals. In fact, water soluble nutrients probably wave at plant roots as they wash past during the wet season. Hi! Good-bye! And they are gone. In 2012 I took a bold step forward, and sampled my soil. 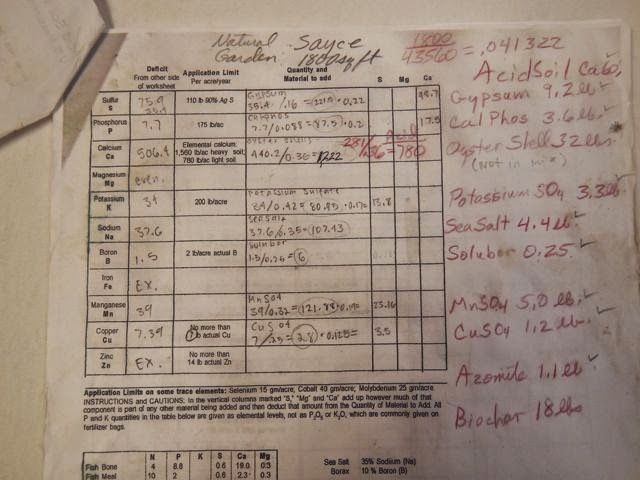 The samples were sent to a soil testing lab. A bold step for me, that is; thousands of farmers and gardeners do this every year. The report came back, full of numbers, a few were high, most were low. The conclusion was that my soil had three minerals in sufficient or excessive amounts (Iron, Zinc and Magnesium). All other elements were nonexistent or at very low levels. The facts: too much Mg, Fe and Zn, not enough Ca, and some minerals were incredibly low. I measured the area of all my garden beds, and took the soil sample results plus the area measurement to a local soil consultant to have a custom blend of minerals formulated for my garden. The soil consultant avoided Calcium compounds that might change the pH of my naturally acidic soil or add more Magnesium. 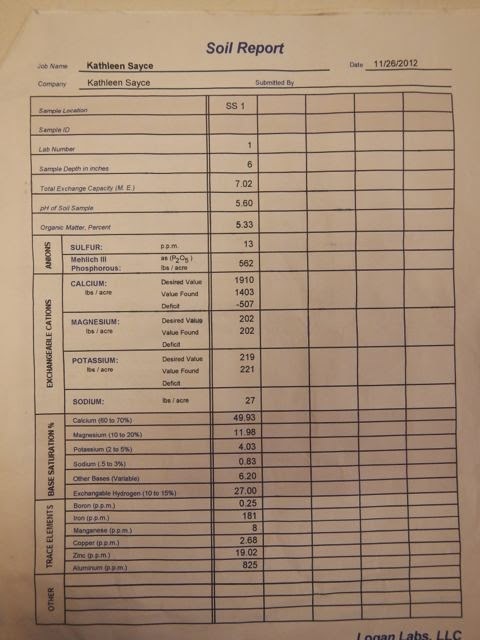 My soil consultant did the calculations by hand, but there are websites where you can plug in your numbers and have the needed amounts of minerals calculated for you. For example, http://growabundant.com has an online calculator. We settled on a formulation that would build up minerals over several years, not trying to bring this garden to an optimal mineral level in one year, but rather to bring it up more gently over three to five years. It was a cautious first step, in hindsight. I went home with three bags, to apply in midwinter, late winter and early spring. To learn what happened, see Part Two later this week. WHAT IS THE DIFFERENCE BETWEEN 'HISTORIC', 'HERITAGE', AND 'LEGACY' IRISES? What is the difference between 'Historic’ ‘Heritage’ and ‘Legacy’ Irises? 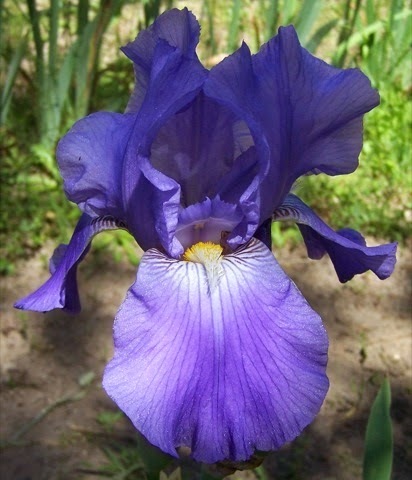 The American Iris Society uses the term "Historic" to describe those irises that were introduced 30 or more years ago. Each year there are a whole lot more that fit into that category. 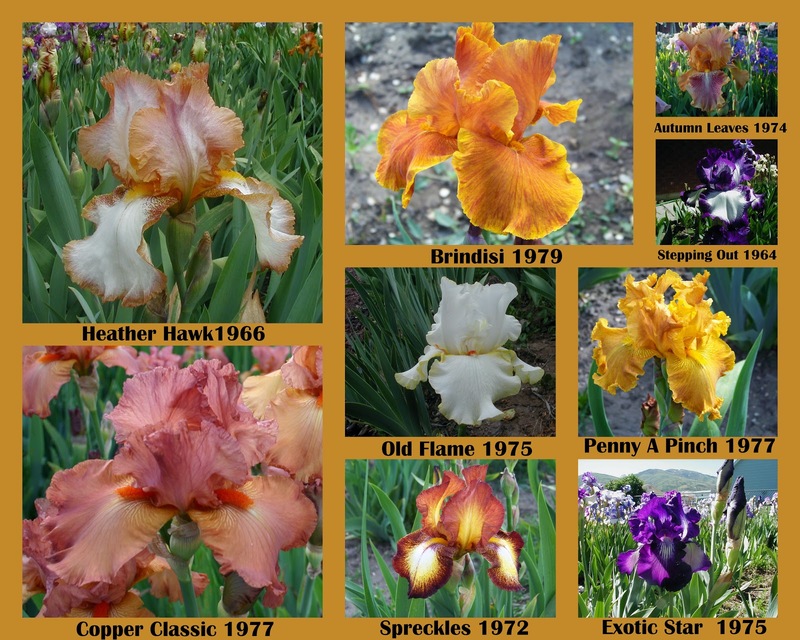 Of the 3 terms listed in the question, The American Iris Society has only accepted and defined the term “Historic”. They have not adopted nor defined the term “Heritage" or "Legacy" Iris. So the terms "Heritage" and "Legacy" are terms used by other iris collectors. In other words if you ask 25 gardeners what "Heritage" and "Legacy" irises are, you might get 25 different answers. I asked a few iris lovers and officials to distinguish between "Historic," "Heritage," and "Legacy" and here is what they said. 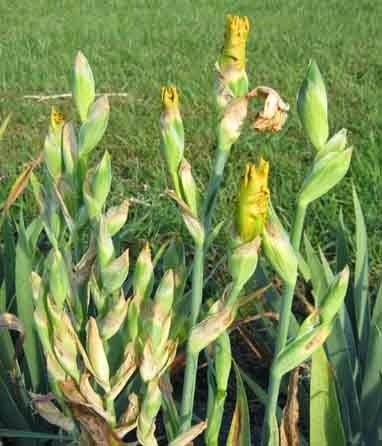 ” I’m afraid I have never heard of ‘Legacy’ irises... though I know that officially ‘Historic’ irises are those over 30 years old – too short a time in my opinion. I’m also not clear about ‘Heritage’ irises. I grow 'Arthur Bliss’ irises which are now nearly 100 years old – definitely ‘Historic’. Very few are available commercially, though I would supply what I can to people in Europe. As you may be aware, cross-Atlantic trade is extremely difficult. " It appears that the terms "Heritage" and "Legacy" are not in wide use in the UK, from what I have been able to gather. Flowers are large and well proportioned. Enormous flowers. Very fine form and extra substance. "As for the terms you describe,only one term you mention, 'historic', is the one that is officially defined and accepted by HIPS, which would deal with THE official descriptions of older iris. 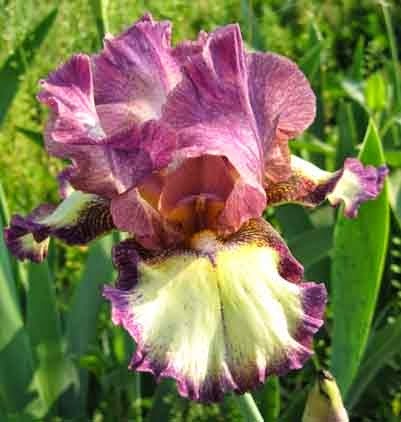 The terms 'legacy' and 'heritage' do not have specific official meanings as far as the Historical Iris Preservation Society goes, although for sure they are meant to describe older iris. 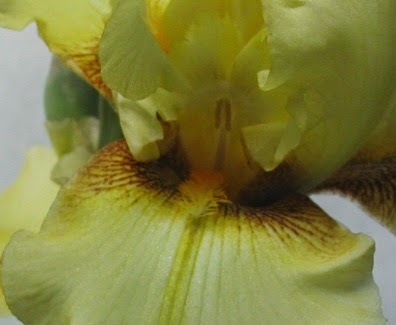 As people have grown increasingly dissatisfied with the use of the term 'historic' for EVERY iris that is over 30 years old the terms traditional and heritage have been bandied about as ways to describe iris that look different from the very old iris, and move the dates of Historic Iris back to pre 50's, or even earlier. However this is just talk at the moment, and because a majority of the Board cannot agree, no decisions have been made. Right now, faced with more pressing issues, there is nothing that the Board of Directors is considering at the moment, and there is no sub-committee to make change recommendations. We will continue to use the term 'historic' to describe iris 30+ years old. If you read anything on the HIPS website you will see that these other two terms are not used in an official capacity in any formal documents. 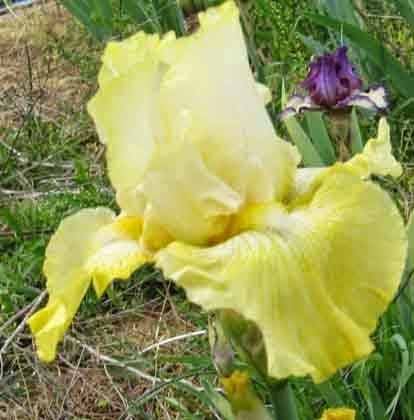 If I were to give you my unofficial interpretation, 'traditional' iris might be considered one that is of the newest wave of 'historics', such as American Beauty, Apple Blossom Pink, Twice Blessed. 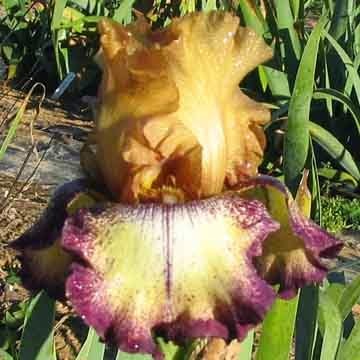 Heritage iris might be of the next older group such as iris from the 50's, 40's such as Chivalry, Black and Gold, Cahokia and the like." "My main 'beef' about the 'historic' designation is that an historic iris from 1980 looks very much like a modern iris from the years post 2000, while those that are older than 1950 do have distinctive form indicative of the earlier times." "HIPS tried a few years ago to redefine what 'Historic' meant. After a lot of discussion, we decided to just leave the definition the same: any iris introduced into commerce thirty years ago. We did not try to come up with new classifications such as 'Heritage' or 'Legacy'. Linda and I do not care for such terms, but prefer “Historic”. It is my impression that the majority of the members of HIPS who took part in the discussion prefer to keep the term “Historic”, and not attempt to use any other terms. What is the difference between “Heritage”, “Historic", and “Legacy” is a subject that would conjure up hundreds of opinions. I am not sure that it is a viable subject for discussion anymore." 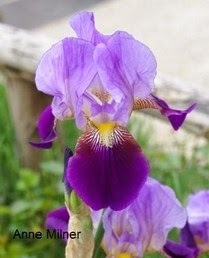 "Here's my two cents on these terms and how they apply to old irises. 'Historic' is an official designation by the AIS that includes any iris over 30 years old. It is the basis for the Historic Iris Preservation Society, which was founded with the intention of stopping the loss of important old irises and keeping them going for future generations to enjoy. 'Heritage' is defined as 'something that comes or belongs to one by reason of birth; an inherited lot or portion.' I have only seen this used in the iris context by groups or individuals as pertains to varieties of national importance. 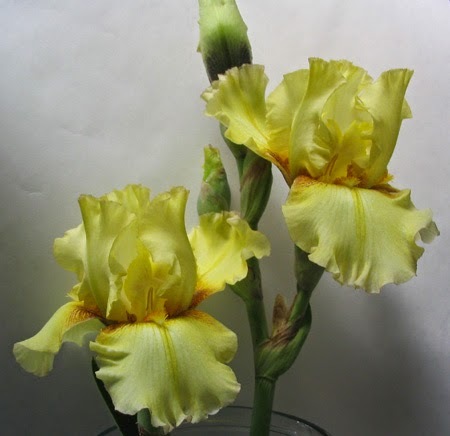 Such as Terry Johnson's blog Heritage Irises which usually focuses on the work of New Zealand breeders, such as Jean Stevens. He writes of others but I think the NZs are the focus. 'Legacy' has, as one definition, 'anything handed down from the past, as from an ancestor or predecessor.' 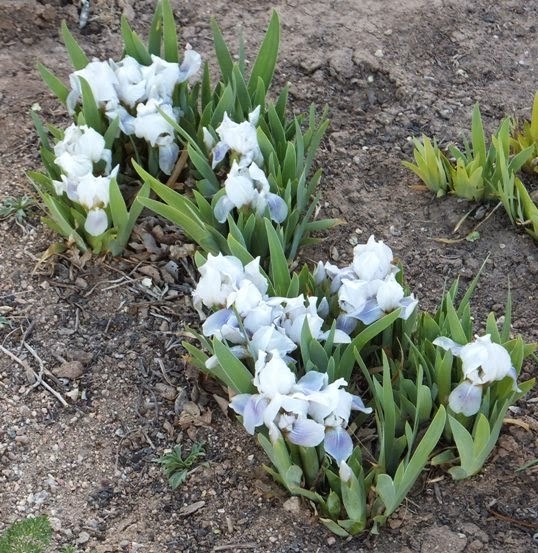 I would only apply this term to collection of irises that fit a theme, like Anne Bliss' collection of the Arthur Bliss varieties, or the Sarah Cook collection of the Morris varieties. Or an individuals collection of varieties their grandmother grew." Mike provided me with 3 beautiful photographs of 'Historics' that he feels should be more widely known and grown. (Snow Flurry X Elmohr), HM 1956. Photo courtesy of Mike Unser. 'Flashing Gem' is on the left and Mike believes that 'Native Chief' is on the right. I asked Mike where he got all his Historic irises and he said that early on he did a lot of ordering from Superstition, Argyle Acres, a little from Winterberry, and from well-known irisarian Wanda Rezac. The vast majority came from other collectors and are pretty rare. 'Maroon Damask' came from Winterberry. The other two may become available from The Pickle Barrel House sale or the HIPS sale where he passed them on for propagation and distribution. 'Historic' is the correct term with an accepted definition. Although many of us may use the terms 'Heritage' and 'Legacy' to mean older irises, there is no official meaning for the terms. What do you think? Do we need more descriptive words to denote age or not? Perhaps just having the year they were introduced is enough? I have loved irises since I was a young mother. Here I am in a photo from 1974 with my son Zane who is now 41 years old. I don't know the name of the iris, which was passed down to me from my mother-in-law. I didn't know that I would later feel the names were so important, and today, it drives me crazy that I don't know the name of this iris! Do you have any guesses what it is? My heartfelt gratitude to Anne Milner, Laetitia Munro, Robert Karr and Mike Unser. Thanks so much for your contributions. While I enjoy the rest and simplicity that winter brings to the garden landscape, by January or February I find myself looking ahead eagerly to spring. Most gardeners think of irises as late spring flowers, bridging the time between spring bulbs and summer perennials. But there are many wonderful irises that bloom much earlier, and help the impatient iris lover through the long wait for bloom. I garden in what is now zone 6 in northern New Mexico. (The older USDA map had us in zone 5). Here the last frost is usually in May. 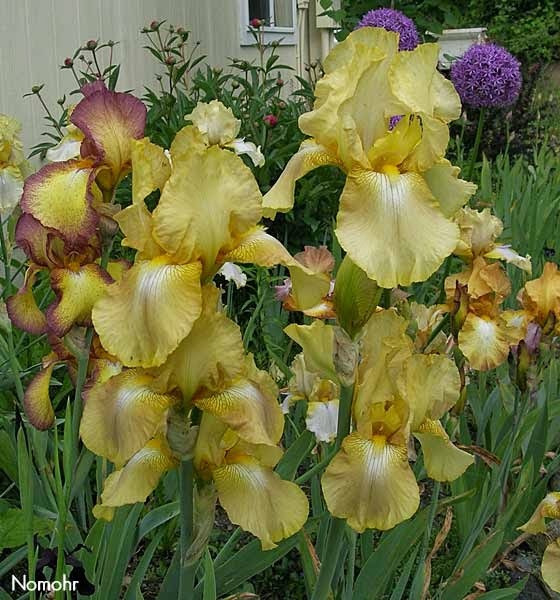 Tall bearded irises bloom in late May and early June. 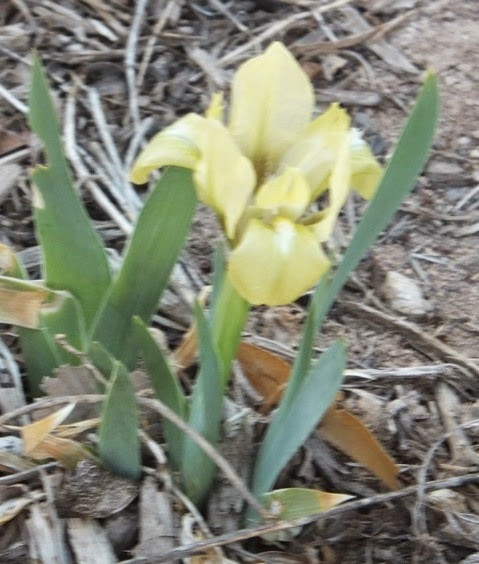 But my iris season begins in February, or sometimes even earlier! 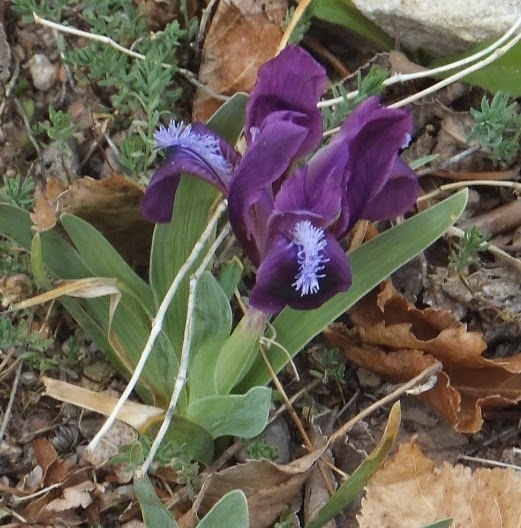 The earliest of all irises in my climate are the reticulata irises (sometimes sold as “rock garden irises”). They often bloom right through the snow! 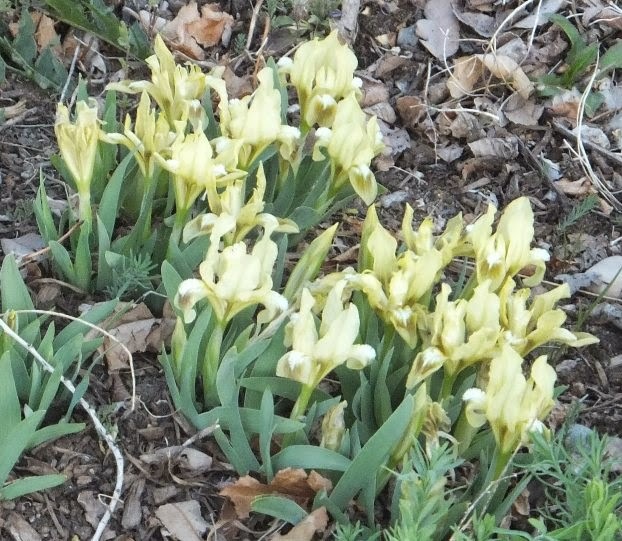 These grow from bulbs, resembling crocus corms. They bloom along with the crocuses too, which is usually March here. However, I have a warm flower bed along the southeast side of the house, where spring bulbs bloom a month or more before those in the main garden. 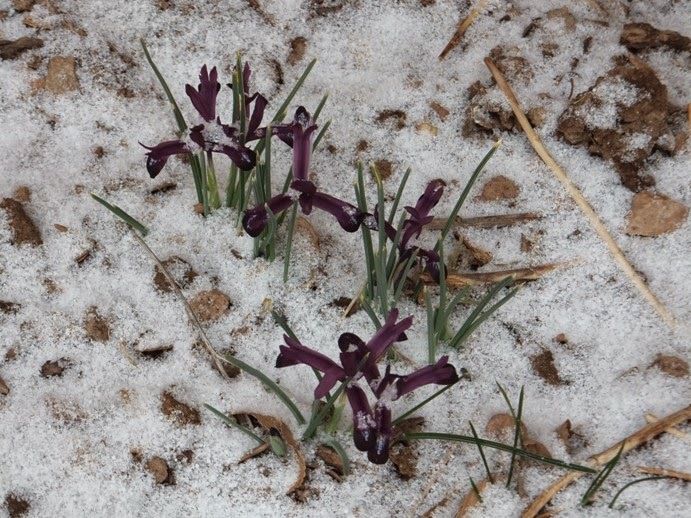 Here the reticulata irises are in full bloom in February; in some years they begin late in January. These are small flowers, about the size of crocuses, though a bit taller. Most of the widely available ones are shades of blue, violet, or purple, often with a contrasting orange or yellow stripe on the falls. 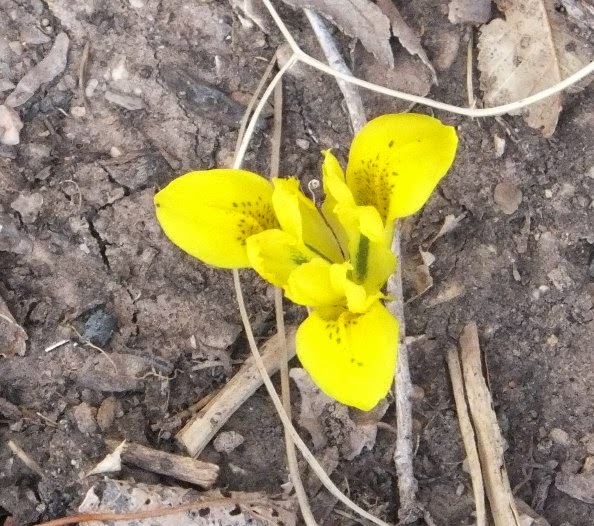 The earliest of all is the yellow Iris danfordiae. This little charmer has almost no standards, the shape of the bloom being formed by its wide falls and style crests. Its bright yellow color is accented by small leaf-green dots. The blue, violet and purple forms in commerce are mostly forms and hybrids of Iris reticulata and Iris histrioides. Some of my favorites are the light blue 'Cantab' and the dark blue 'Harmony'. There are also white ones, and a lovely pastel blend of sky blue, cream, and gray tones, 'Katharine Hodgkin'. These wonderful irises are available inexpensively almost anywhere you can buy crocuses, daffodils, and tulips. In some gardens, they multiply from year to year. Elsewhere, they may dwindle away. (Planting deeply may help.) But they are inexpensively replaced and well worth it for the cheer they lend to the late winter garden. It’s surprising that they are not as widely grown as crocuses or snowdrops. They surely deserve to be! Among the more familiar bearded irises, the earliest to bloom are the miniature dwarf bearded (MDB). Although these grow from rhizomes like their tall bearded cousins, they are less than 20 cm (8 inches) In height! An established clump presents a carpet of color before the taller ones are even sending up their stalks. These are available in a wide range of colors, patterns, and flower shapes to suit every taste. 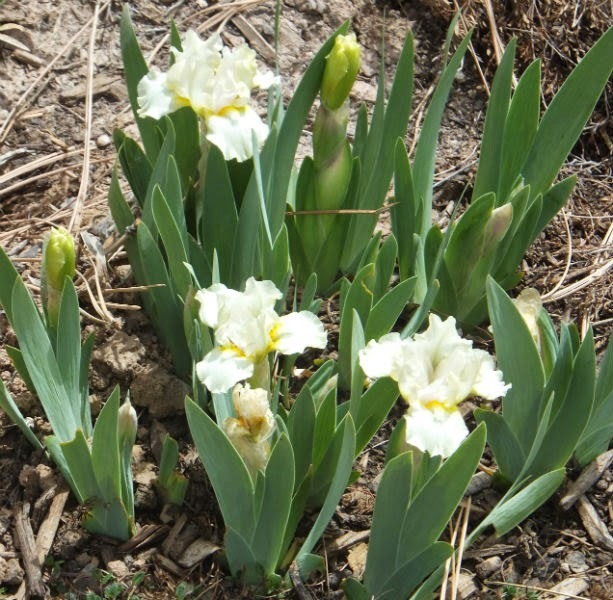 In my garden, the bearded iris season begins with the species Iris pumila. This little gem is native to eastern Europe, from Austria to the Caucasus. Bloom usually begins here around the beginning of April, and carries on for a full month. The dainty, perky blooms come in violet, blue, yellow, cream, and white, often with a contrasting darker spot on the falls. They have hardly any stem at all, blooming right on the ground, with the tops of the blooms just a few inches above the soil. There are some named cultivars of the species, such as the well-known 'Little Drummer Boy', 'Suslik', and 'Hobbit', as well as more recent introductions such as 'Steppe', 'Royal Wonder', and 'Wild Whispers'. 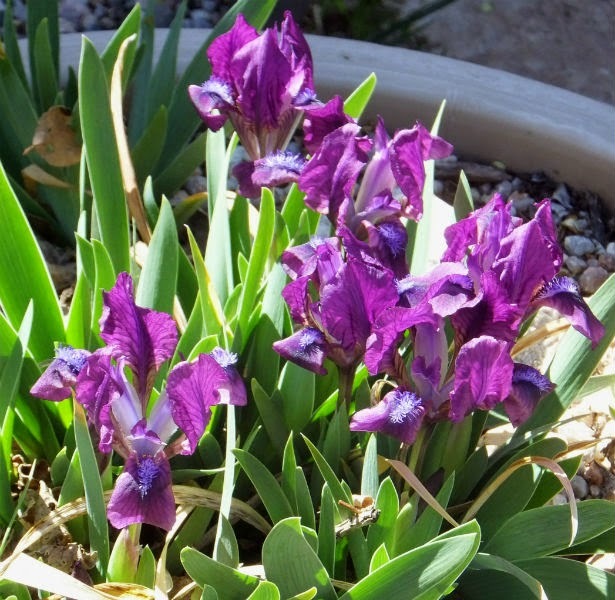 To find this delightful species, you will have to turn to specialist nurseries, either iris enthusiasts are rock-garden aficionados who seek out wild plants from around the world. 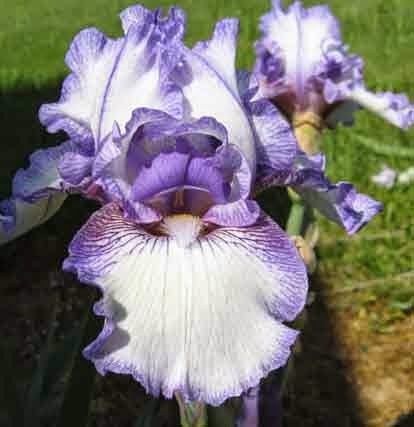 Beware that there is an unfortunate practice in the nursery trade of labeling any small bearded iris as “Iris pumila”; if you see such a label at a local garden center or home improvement store, it is almost certainly not the real species. 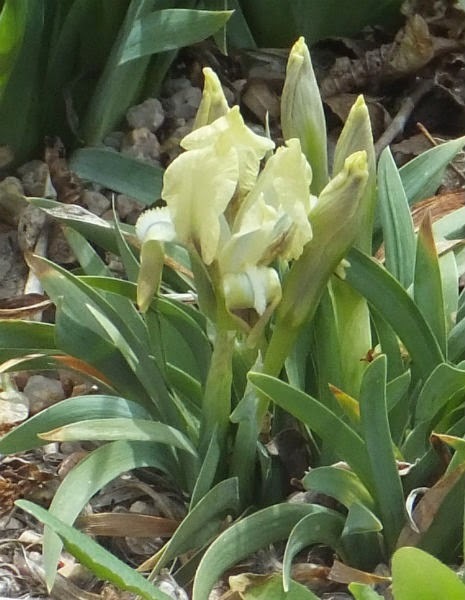 Iris pumila comes from regions where it is cold in winter. It does fine in my garden, where winter temperatures down to around 0 F are normal, but growers in warmer-winter climates report that it does not persist well for them. There are two similar species, Iris attica and Iris suaveolens, that come from the southern Balkans, Greece, and western Turkey. It seems these might do better in warmer gardens, but they are not widely grown. Again, you will need to seek them from specialists. 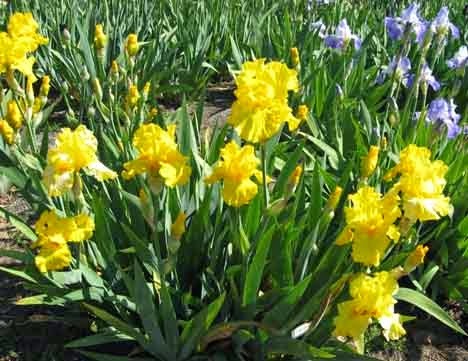 Easier to find are the hybrid miniature dwarfs, derived from Iris pumila but with some tall bearded irises in their ancestry as well. These tend to be a bit larger than Iris pumila, and bloom later. Their time is late April into early May in my garden. 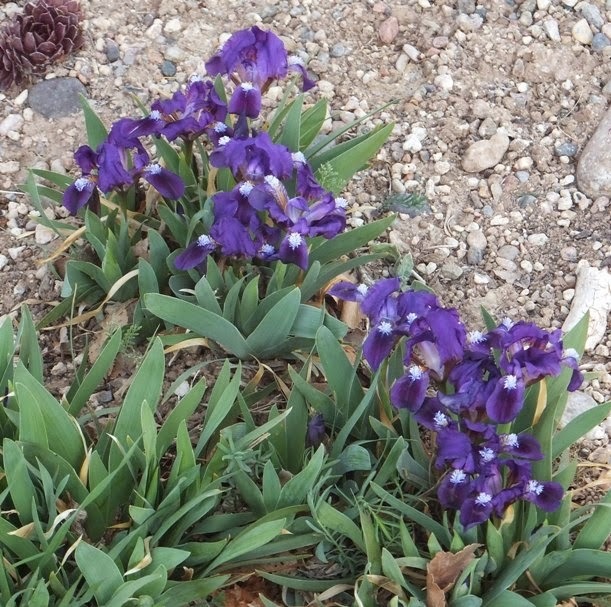 Although not commonly found at garden centers, many commercial iris growers list some of them. 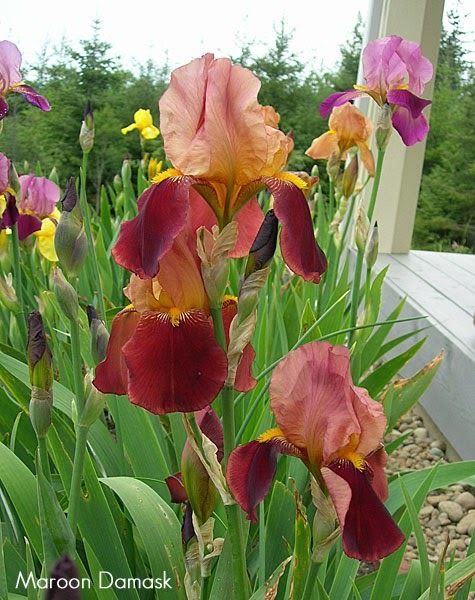 These are available in all the colors seen in Iris pumila, as well as other colors from their tall bearded ancestry, such as pink, orange, plicata, and sometimes contrasting red or blue beards! They are quite adaptable to different climates, although most appreciate a winter chilling. Some favorites of mine are'Alpine Lake' (white with a gentle blue spot), 'Icon' (bright orange with a darker spot) and 'Dollop of Cream' (ruffled creamy white). By the time the miniature dwarfs have finished, iris season is well underway, with medians and arilbreds beginning to bloom and the tall bearded not far behind. I do love the head start on spring these earliest irises provide, but I would grow them even if they bloomed later. 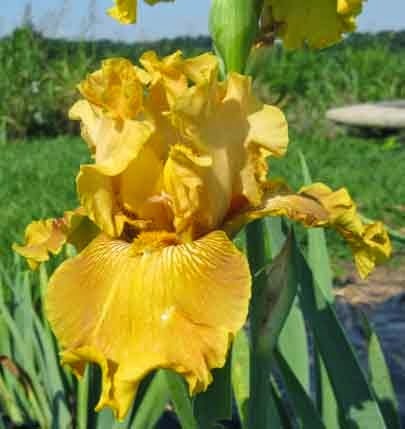 Their charm and daintiness speaks to me, and I enjoy the variety and fun they add to an iris collection.